Summer SOJ Opening Day is Saturday! 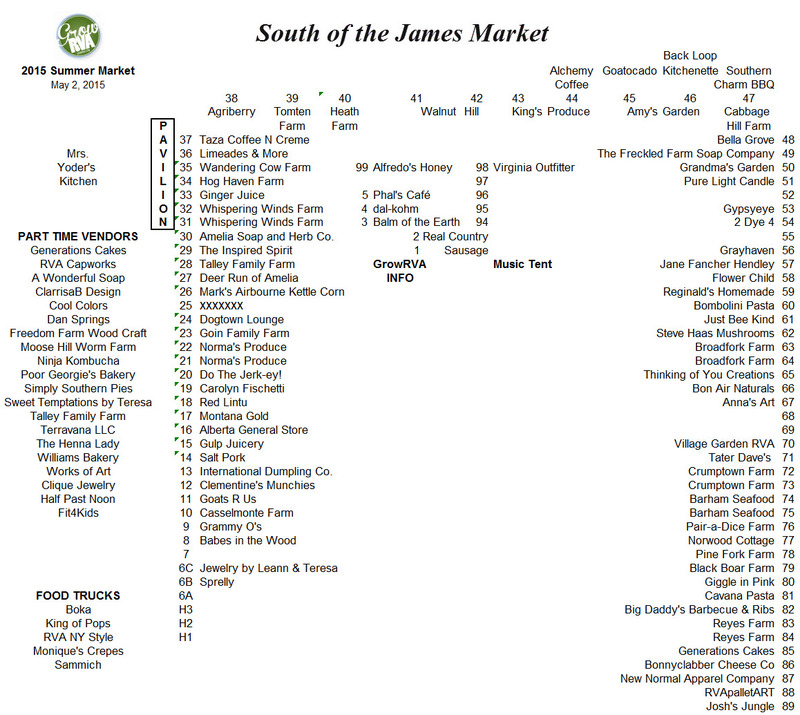 The South of the James Market’s Summer Season officially kicks off Saturday, May 2nd. And boy do we have some quality local goodness coming your way! Take a look at the map below. Our full time vendors are listed in their spaces. The part time vendors are listed to the left. Neighborhood coffee shop Taza Coffee n’ Creme is taking over for Blanchard’s Coffee. Same delicious locally roasted coffee, just some new friendly faces serving it. The Reyes Farm is new to the market but you will recognize the farmers! Juan & Jose Reyes have worked for the Flemmer family of Walnut Hill Produce since they were kids. They are branching out on their own this year (with the Flemmer’s blessing of course). Local probiotic drink maker Ninja Kombucha is bringing their high quality, delicious kombucha to SOJ at prices below what you would pay at the store. Industrial meets modern upcycled functionality with RVApalletART. They design with and are inspired by the transport items that build America. Goochland’s Hog Haven Farm offers their all natural, heritage breed, pasture-raised, local pork. Their pigs are fed a non-GMO diet. The Talley Family Farms are one family working on multiple properties to bring you quality beef, dairy, vegetables and soap. dal-kohm is a small batch baking company sharing the simple joys that pastries can bring. Other new vendors we will feature in future updates include Sprelly, Gulp Juicery, International Dumpling Co., RVA NY Style and Freedom Farm Wood Craft. Read more about them here. Our returning vendors will be knocking your socks off as usual with their fantastic food and art offerings. Get ready to load up your bags with a week’s worth of groceries. The farms are back! See you Saturday. Summer hours are in progress. We open at 8AM. Encourage your friends and family to support their local farmers market too!